Somehow, the Christmas season seems so much more special when it is shared. The festive lights, the flowers, even the food seems that much more memorable when accompanied by family and friends, and shared in a cozy home. That’s why Delaware’s Top Christmas Celebrations always shine – they are perfect opportunities to head out with loved ones for a day or two celebrating the spirit. They’re also the kind of events that are perfect for combining with other holiday excursions – like doing some tax-free shopping at Delaware’s malls and boutiques. This grand mansion is an awe-inspiring holiday sight, with its already lavish rooms decorated in the same ways that the DuPont family did when this was their home. Be sure to check out the majestic dried-flower tree (with more than 60 varieties). Other highlights include a woodland path in the winter garden (part of a 1,000-acre rolling meadow preserve), and vistas of elaborately decorated trees. Winterthur also offers many events, workshops and performances during the holiday season, including Yuletide Brunches and appearances by Santa. Admission: Adults $14, Children 6-14 $5, Children 5 and under and Hagley Members free. See how the holiday traditions of France were brought to America by the DuPont family when they started their empire here on the banks of the Brandywine River. The original American mansion of the DuPonts is a testament to old-world grace. Enjoy a rare opportunity to see Eleutherian Mills, the first du Pont family home built in America, dressed for the holidays and illuminated with softly glowing lights. Lace, fresh greenery, poinsettias, and dried flower arrangements adorn holiday displays throughout the residence. Times: 9:30 a.m., noon and 3 p.m. Tue.-Sat. Noon and 3 p.m. on Sundays. Always among the most elegant and regal of the DuPont mansions, Nemours prides itself each holiday on its dazzling Christmas trees adorned with hand-painted ornaments from the early 1900s to the present. Guests will be whisked back in time to hear stories about how Alfred and Jessie du Pont shared the holiday with family, friends and staff. Drive through a Cape Henlopen State Park filled with the bright, beautiful colors of the two-mile “Light Spectacular” holiday light show, which includes more than 60 awe-inspiring displays. Enjoy the fun at the Cape May-Lewes Ferry Terminal, which will become the “Christmas Village.” The village will have an ice skating rink, live music, indoor holiday workshops, a strolling Santa and carnival rides, including a giant Ferris wheel. Stroll at your own pace through this charming seaside town, enjoying the historic homes in their Holiday best. Festivities will accompany the day at Lewes Historic Complex, including a Christmas Antiques Bazaar, Bake Sale, and Holiday Greens Sale, capped with a Christmas Parade and tree lighting. Times: 10:00 a.m. - 5:00 p.m. Step back in time at the Historic Odessa&apos;s annual Holiday Celebration - a seasonal tradition of interpreting scenes from classic literature. This year you&apos;re invited to tour the National Historic Register Wilson-Warner House transformed into vignettes inspired by E.T.A. Hoffman&apos;s tale of The Nutcracker and The Mouse King; 2016 celebrates the book’s bicentennial (200 years) reacquainting us with the beloved characters and remembering fantastic scenes. The Colonial-era homes of Odessa are the stars of this self-guided walking tour of private homes and public buildings decorated for the holidays. Be sure to also check out the Christmas Craft Shop at the Appoquinimink Training Center, 118 South 6th Street, from 9:30 a.m. until 5:00 p.m. Freshly cut greens will also be for sale at the barn behind the Wilson-Warner House, where visitors can enjoy demonstrations on wreath making and flower arrangements using the greens. 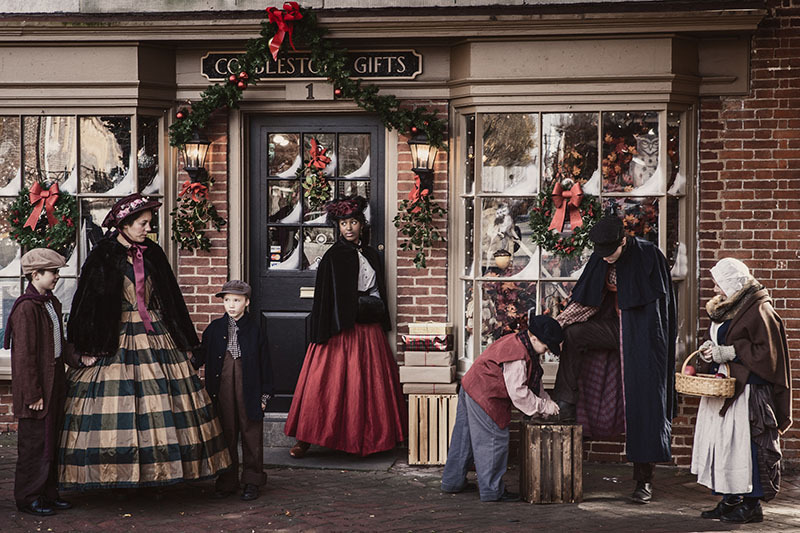 This Colonial-era village is the perfect setting for an elaborate re-creation of 19th Century London and Charles Dickens&apos; holiday favorite, "A Christmas Carol." Don’t miss the street theatre performances of the beloved tale, along with an authentic Victorian Tea held at The Arsenal at 11 a.m., 1 p.m. and 3 p.m.